When we bought our house, the master bathroom was decorated in not-so-lovely shades of brown. While we haven’t wanted to splurge on redoing the tile, we have completely repainted the whole thing, bought new hardware, and really tried to update the look. A constant thorn in my side keeping me from truly enjoying our bath was the swirly brown cultured marble vanity top. After hours of internet research, I decided to try out a product called Rust-Oleum’s Tub and Tile Refinishing Kit. 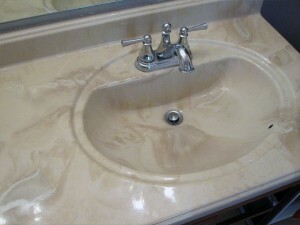 We would like to completely replace the vanity and tile one day; this $25.00 fix was meant to only get rid of the swirly brown for now. I used a brush (for the sake of experimentation) to do the second coat, and I would really recommend the opposite approach to anyone undertaking this project. The brush will allow you to get a really heavy coat first coat (no streaks). If you follow that with a rolled coat, I think the smoothness would result in the perfect finish. The brush definitely adds more bubbles. The directions indicate a second coat is ok after an hour drying time for the first. But don’t extrapolate & think that you can touch the top after the second coat dries for an hour. It feels dry, but those fingerprints will stay! Stay tuned for the finished product (after the full 3 days drying time)! Suzanne, great look! Thanks for the tips. You may become the new DIY expert and have your own show. Haha, thanks so much for checking this out! It’s fun to try these projects; I usually just keep my fingers crossed! Our countertop has been holding up just fine. With all the cleaning (and bathroom crud that builds up between cleanings), it is as shiny as when we first applied the stuff. It really has been a show-off DIY project. One of my friends was asking about the whole process and whether I would recommend it to anyone else recently. I must say, I really loved the results, but the fumes from that stuff really stick in the back of my mind. It was completely toxic. We took precautions, and opened the windows, and wore masks. But if you only have an unventilated space to do it in, I would definitely recommend not doing it. Hope that helps & good luck everything! It’s in a guest bath that gets almost ZERO use. Would you say it’s still holding up after all this time? I’d love an update! It still looks great. I think I’m going to be replacing it this summer with a real countertop finally, but it’s held up perfectly! um, you painted your marble counter-top? seriously? I really dont want to be rude here, but I think that is nuts. Your husband is a very patient man for allowing you to do this. You are a very lucky woman to have him. Marble is classic. Marble is timeless, Marble is created by mother earth herself, it is not effected by style trends. Marble is naturally beautiful and never goes out of style. Paint, no matter what the label says, will scratch and chip and peel off. and furthermore it will always have the “slummy” look of being, well, painted. Good for you for reducing the resale value of your home. I would never paint a marble counter top I painted an ugly cultured marble counter top. Cultured marble is not marble; it’s a pour molded mix of polyester resin and a granulate filler – usually calcium carbonate. It’s cheap, and in this case, it was ugly. Furthermore, I only painted the cultured marble as a stopgap to get rid of the look in the bathroom. We had some other remodeling priorities before replacing the perfectly good (ugly) counter top Additionally, the paint that you say will scratch and chip still looks great; it’s in the same condition as it was on the day we finished the project. That said, we are currently in the process of choosing the counter top upgrade, and I am very happy that I painted the counter top back in 2010. Thank you so much for your concern, but I’m confused as to why an obviously uniformed person (such as yourself) would seek out my blog, not even read my post, and then comment to berate me on my choices. Maybe you could spend your internet time elsewhere? Wow – it held up for a couple of years! That is amazing! I have dark green cultured marble in my bathroom and I bought the tub and tile kit a few months ago, but have been having second thoughts. Your post has inspired me to go for it! Worst case scenario, it can be replaced in the future. Anyway, thanks for posting this as you are the only site I could find that showed a before and after for using the rustoleum (against the company’s recommendation – but a little defiance is healthy!) cultured marble. Best Wishes! Glad to be of help! Thank you and good luck on your project too! Oh my gosh. “Your husband…’allowing you’…” what in the WORLD, do we live in the 50’s?? I LOVE your post, I’m DEFINITELY doing this (Husband’s ‘permission’ NOT needed).. And I must commend your gracious reply to ‘Derek’ lol!! That’s a awesome job! Someone needs their head examined that thinks cultured marble is timeless. Lol! Mine is over 7 ft of almond with white swirls. So lots of $$$ to replace it and looking for something to get me by for a couple of years as well. My question is- exactly what product did you use? The one that I keep finding at Home Depot is $250. Did I misunderstand that you only spent $25 to resurface yours? Thanks in advance! 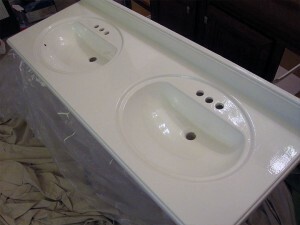 I used the Rustoleum Tub & Tile Refinishing kit; it was pretty affordable! Evidently, the manufacturer doesn’t actually specify cultured marble for the product, but it worked great for us! Just wondering, how did this hold up to heat? Did you ever put a flat-iron on the surface? I used and this product years ago on a bathtub and it held up well. It’s great to know this worked on the cultured marble. I’m getting ready to sell my house and have the ugliest counters in the bathrooms. I’m definitely going to give this a try. After all, what do I have to lose? Ugly counter tops. I have horrid medium brown (darker than yours) cultured marble from the 70’s and can’t currently afford to fix them so I am going this route. 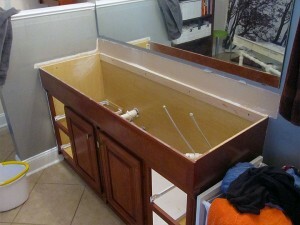 I was wondering if I HAVE to take the counter top off or can I tape it off and work with it installed? You did a great job. 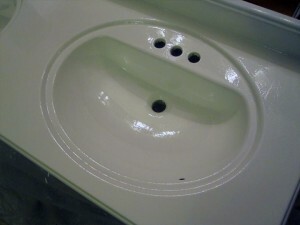 Now I’m going to do my bathroom sinks I have the double sinks like yours. I have use Rust-Oleum’s products before. Stone faux paint that’s in a can on and old Roman column I had and that was back in 2000. And it’s still looks good on my front porch. Lol! And as for Derek he can kick rocks. I will also try the granted or stone finish on it. I will let you know how it turned out. Your project looks great,I’m wondering how you did the sink. I can see using a roller on the counter but the sink? Mine is cracking all around the drain, hoping this will improve the appearance. Well, the drain is pretty easy. The product is pretty viscous and coats easily. In the pictures that I took, I used a 4″ roller for the first coat and a brush (which I then threw away) for the second. I would definitely recommend reversing that order if I were to do it again. The brush will allow you to layer it on thick, and the second coat with the roller smooths it all out. Just make sure you remove all the hardware! WOW!What a beautiful job. I, too, have the “before” pictured vanity color/style. I’m so relieved to hear there is a DIY resurface plan. Thank you for sharing your project t. Wow!!!! You did an awesome job!! You go girl! 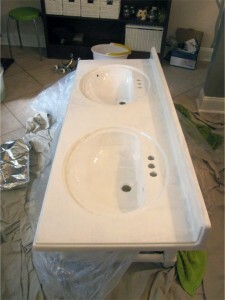 I am now going to do the same thing to my swirled, mint green, cultured marble vanity top. I bought a foreclosed property that needs some TLC. I have put a lot of money into the property already, being that it was a foreclosure, and this can provide a great alternative, money-saving way to make my vanity top look great. Thank you for publishing your awesome post! We just bought a home with brown cultured marble in every bathroom (shower surrounds, tubs and counters)…really thinking about painting for an updated look without breaking the bank! How long did this last? It looks great! I would like to do this in the house we are buying (as well as painting the tub surround which is how I found your blog!) Does the counter have to be removed? I am thinking this will be a project I do on my own and I don’t feel confident that I could remove it myself. It’s a double sink and fairly long. Or could you explain how to remove it if it is caulked on better than yours was? I would recommend using some kid of knife/blade to cut through the caulk, then scraping the caulk off before applying the refinish. You’ll be surprised how light the culture led marble actually is. We just tore out a cultured marble vanity top (cut down to fit by previous owners) and we can’t find pre-made vanity tops that will fit. Our options are to buy new – and try to cut the vanity top – or refinished the old one. This gives me hope that we can refinish the old one. Thank you! Such a relief to find your post. 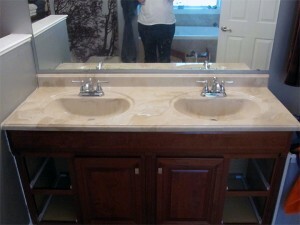 I too find bathroom countertops keep moving further down the remodel list! I’m going to give this a shot! Thank you!